But the idea that renewables are “cheap” is a lie and those on the left know it. Yet no one in the media ever challenges them. Let’s be clear about an economic reality that environmentalists have spent four decades trying to hide: Without massive government subsidies, there would be no wind or solar energy to speak of. They are complete creatures of government favoritism, and after 30 years we still can’t cut the umbilical cord. This is true, and I’ve shown that even — or better said, especially — renewable energy advocates admit it publicly. Renewable energy advocates have also been repeating the same line about that their industry being “almost there” in terms of being able to stand on their own since the 1970s. Media, however, constantly peddle the impossible notion that solar and wind are powerhouse industries that can’t survive if you remove any government subsidy from them. Consider how gargantuan the green energy subsidies are. First, wind and solar receive a tax credit that is basically a 35 percent-off coupon for the energy they supply with taxpayers picking up the tab. If coal or nuclear power got a 35 percent taxpayer subsidy for every kilowatt of electricity they supplied, they would be basking in profits. I helped write and negotiate the just-passed Trump tax bill. When we tried to get rid of the renewable energy tax credit (i.e., create a “free market in energy”), the green lobby went ballistic and told Republicans this would put much of the industry out of business. The accompanying chart shows just how un-level the playing field is today. 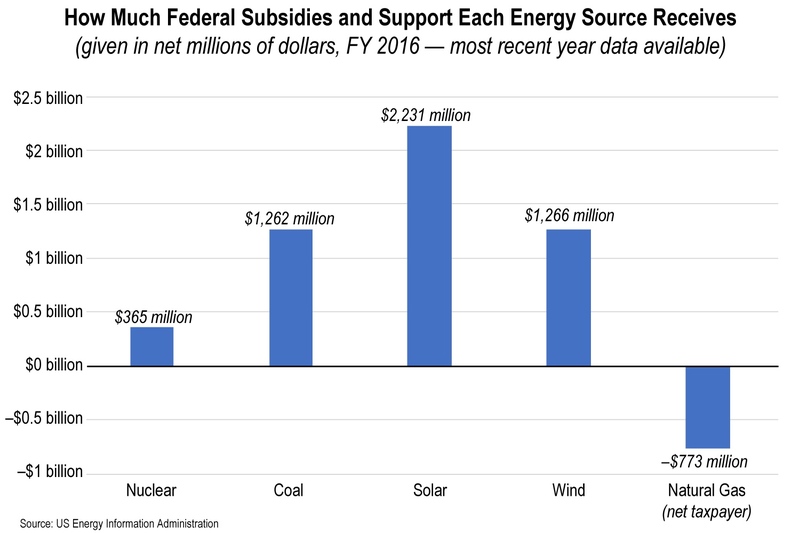 For every dollar that coal and nuclear power receive, wind power gets almost $5 of subsidy and solar receives about $20. This does not even include the biggest subsidy of all: About half the states have renewable energy standards requiring utilities to buy 20 percent to 30 percent of their power from wind and solar regardless of the price. What other industry in America has that kind of golden parachute? Do you see the leftmost bar for natural gas and petroleum subsidies? Do you see that — unlike all the other energy sources — it’s negative? Do you know what it means to receive “negative tax subsidies”? Solar: 1.2% of the nation’s electricity for $2,231 million in subsidies. Wind: 5.4% of the nation’s electricity for $1,266 million in subsidies. Coal: 29.6% of the nation’s electricity for $1,262 million in subsidies. Nuclear 19.6% of the nation’s electricity for $365 million in subsidies.